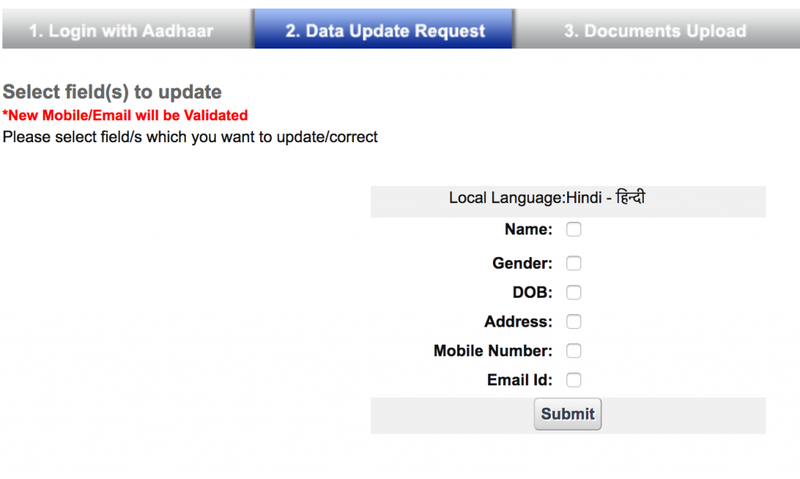 May 18, 2018 / 6 Comments on How to Update an Aadhaar Card? 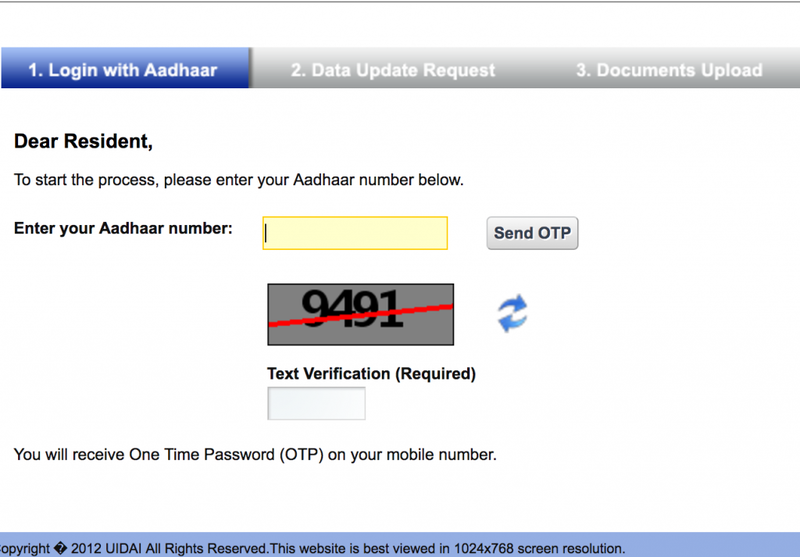 Enter your Aadhaar Card number in the field provided. 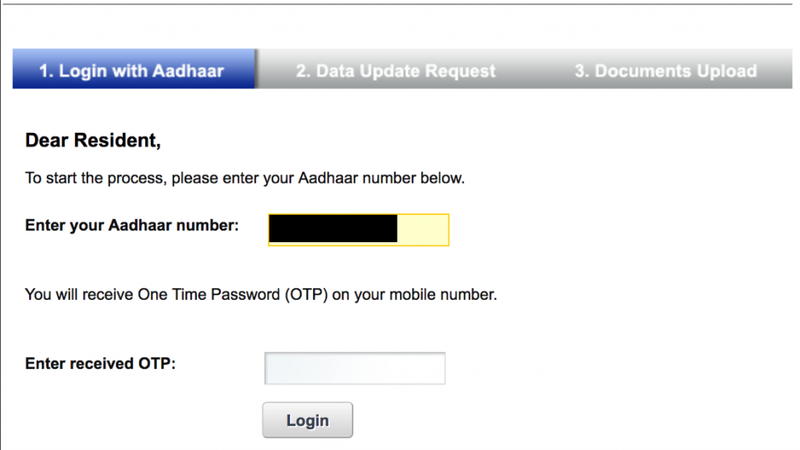 A One-Time Password (OTP) will be sent to your registered mobile number, and you require to log in to your Aadhaar account. After this stage, you will have to select BPO service provider. You can either choose Aegis or Karvy and then submit. Government photo ID card/service photo ID card issued by PSU. Photo ID card issued by a recognized educational institution. Photo of bank ATM card. Freedom fighter photo ID card. Address card having name and photo, issued by the Department of Posts. Certificate of identity having photo issues by Gazetted Officer or Tehsildar on an official letterhead. An affidavit executed on a non-judicial stamp paper. Proof of marriage document issued by a Registrar. Electricity bill (must be recent and not over 3 months old). Water bill (must be recent and not over 3 months old). Telephone landline bill (must be recent and not over 3 months old). Property Tax receipt (must be recent and not over 3 months old). Credit Card statement (must be recent and not over 3 months old). The signed letter having a photo from a bank on the letterhead. The signed letter having the photo from a registered company on letterhead. The signed letter having photo issued by recognized educational institution on letterhead. Certificate of address having photo issued by MP/MLA/Gazetted Officer/Tehsildar on letterhead. Certificate of address issued by village panchayat. Registered agreement of sale, lease, or rent. Photo identity card issued by Department of Posts. Case and Domicile Certificate with photo issued by State Government. Disability ID Card/handicapped medical certificate. Gas connection bill (should be recent and not over 3 months old). For minors – passport of parents. UIDAI takes a total of 15 days to process the application/request and will update the Aadhaar information on file in that time. UIDAI (Unique Identification Authority of India) which is responsible for managing governments flagship program Aadhaar has recently launched a self – service UIDAI Portal (SSUP) where the card holders can visit and update the information they wish to update. This service is extremely convenient as one does not require paying a visit to the enrolment centre in case of any error. In this article, we have listed out ways through which one can update their mobile number and also check status of their updates. Once done you will receive a confirmation message that your update request has been sent. And after that you will receive a unique URN. Keep this number safely as with the help of this number you can check status of your update request.